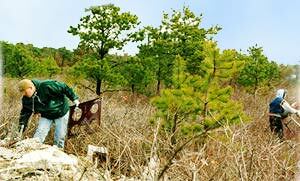 In the midst of a sprawling suburban community on Long Island is a large tract of land that has been the sad recipient of discarded goods and neglect. As more trash accumulated on the site over the years it became even more reason for those with truckfuls of unwanted garbage to make their dumping quick and cheap and easy. Native America was part of a group of local concerned groups that drew attention to the value and important of this neighborhood habitat. 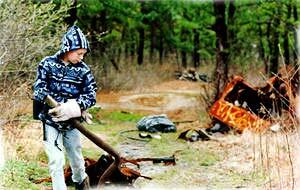 Local people and organizations were rallied to remove the refuse from the land and have it carted to a nearby landfill. After days of collection and toil the land began to look clean once again. 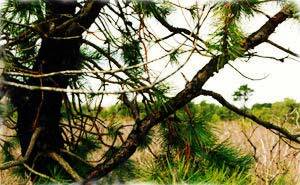 The bear oak, pitch pine, dwarf white oak, and blueberry bushes of this area of Long Island, New York were again able to boast the beauty of of this unique Oak Brush Plains habitat. The community at large is now aware of the importance of this area and is able to embrace it as something to be proud of. 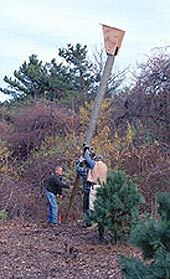 In an effort to help woodpeckers breed in the face of displacement by the introduced european starling, Native America is erecting shielded woodpecker nest boxes in parks, preserves, and refuges. The one pictured here was put up behind the visitor's center at Jamaica Bay National Wildlife Refuge in Queens, New York. 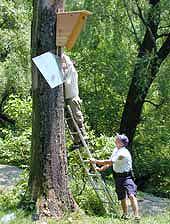 Native America places a shielded Woodpecker nest box in the middle of New York City in Central Park. 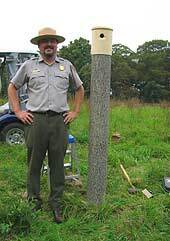 In early autumn of 2004, Native America placed two nest boxes for bluebirds in the fields of Theodore Roosevelt's home on Long Island in Sagamore Hill. Teddy Roosevelt enjoyed watching and identifying the birds on his property and the bluebird was among them. While there are no records of nest boxes there in the early 1900's, today's dwindling native bird populations need nesting site supplementation.